Key questions remain about the operational and financial viability of a completely paperless bank such as India Post, says Mayank Jain. With a budget of Rs 14.35 billion allocated by the government, sleeping giant India Post is hoping to reincarnate itself as the India Post Payments Bank. Even before the glittery launch last Saturday by Prime Minister Narendra Modi, the payments bank was already the biggest in the country. It now seeks to convert all 1,55,000 post offices into banking access points, and more than 400,000 India Post employees are set to become bankers. Is the Rs 14 billion gamble likely to pay off? The clues to India Post's banking future lies in the past. Ever since the RBI rolled out payment bank licences to 11 entities in 2015, only three banks -- Paytm, Airtel and Fino -- have completed more than six months of operations. India Post becomes the fourth one to have had a full-scale launch. 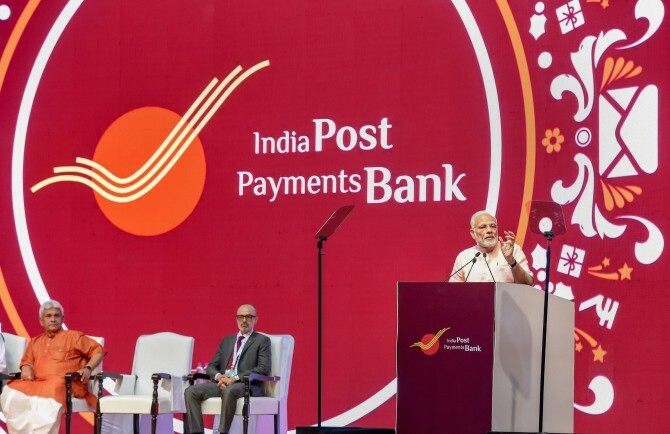 Despite arriving late, IPPB is already far ahead, banking on the government's backing that ensures adequate supply of funds and special "sweep" provisions, unavailable to private competitors, such as permission to link more than 170 million India Post Savings Bank accounts to the shiny new payment bank. In its armoury are 650 branches and 1,55,000 post offices, almost three times as much as the 55,069 branches operated by all scheduled commercial banks in rural areas in the country. With its near dominance in the financial inclusion market, IPPB should find it relatively easy to acquire new customers. A press release on the day of the launch said the bank has been enrolling thousands of customers while it hopes to roll out banking services to all post offices by the end of the year. But some key questions remain about the operational and financial viability of a completely paperless bank such as India Post. For instance, the first concern -- even inside the bank's headquarters in Delhi -- is its dependence on Aadhaar, India's largest biometric identity programme. From opening an account to withdrawing cash to making a deposit, it's necessary that the customer's fingerprints match the UIDAI database for each transaction. In the absence of matching fingerprints, users are likely to be locked out of their accounts, according to a senior banking officer with the organisation. The problem is that the UIDAI told the Supreme Court in March that it can't ensure 100 per cent biometric matching. The link to UIDAI has proved problematic with the three operational payment banks for a variety of reasons. Paytm, Airtel and Fino have all had their licences suspended in the past for reasons relating to e-KYC processes. As of now, Paytm Payments Bank and Fino cannot accept new customers and are only allowed to service existing ones. In Paytm's case, the violation was on opening new accounts without proper consent of their customers and not following KYC guidelines. A similar thing happened with Airtel Payments Bank, which was shut for new users for almost seven months after allegations of opening new accounts without explicit consent. It finally received a go-ahead from the RBI and the UIDAI only in July this year after being fined Rs 50 million. Then there's the cost of simply operating an account with the IPPB. According to documents accessed by Business Standard, there are at least 80 charges and restrictions that come with an account. The ones that will hurt the most are cash withdrawal charges for all customers and cash deposit charges for merchants. The payments bank is charging Rs 25 plus GST for each transaction at a customer's doorstep. Non-financial transactions such as online bill payment or check-book request registration at the doorstep are also priced at Rs 15 plus GST. These costs could be circumvented by going to an IPPB branch, but many post offices in the country are manned by less than two people and are unlikely to hold large volumes of cash. At best, a senior official said, they will register a request and deliver cash to the doorstep when it is available -- at the cost of Rs 25 plus GST. While the allure of doorstep banking for rural India is likely to prompt many to open accounts at zero balance with the bank which offers 4 per cent interest on savings, the hassle of withdrawing money is likely to cause friction. For instance, the payment bank doesn't deal in plastic debit cards or even the latest payments offering, Unified Payments Interface, which allows money transfer. Instead, it allows inter-bank transfers over Immediate Payment Service which is chargeable from Rs 5 to Rs 50 depending on the value and mode of transaction. For merchants, a cash deposit fee of Rs 1.5 per additional Rs 1,000 deposited applies if they deposit more than Rs 15,000 with the bank. It's almost as though IPPB doesn't want your money. Among expected damages are charges for cheque collection, stopping payments, issuance of a paper statement and even closure of the account within six months. It is unlikely that the bank will be used by urban citizens who have easy access to private banks offering purely digital accounts with more services, interest rates of up to 6 per cent and latest technologies like UPI. Even in rural areas, however, IPPB is unlikely to make much sense since Jan Dhan Yojana has already provided people zero balance bank accounts with RuPay debit cards. Officials argue that charging for services is the only way for IPPB to make money. Considering that payment banks can only take deposits of Rs 10,0000 per account and can't lend from their own balance sheet, the estimates of breaking even inside the government range from four to eight years. Even if IPPB hits the ground running and starts making money through these charges, it will have to share a substantial chunk with its ground force of postal workers: Rs 15 out of the Rs 25 charged for doorstep services go to the servicing postman. Moreover, the department of posts isn't in the pinkest of health. Its deficit doubled in the year 2016-17 to Rs 119.69 billion from Rs 60.07 billion in the preceding year. If this isn't all, only 55 post offices have been added in the country in the last five years, according to official data. At the same time, mail traffic has in fact decreased by 1 per cent in the last year. Add all of this to the fact that the department of posts loses money on almost every single service it provides -- averaging Rs 154 on each money order, for example -- and you get an organisation that is old, weary, cash-starved and inefficient. As the beacon of inclusive banking, it appears to be an ill-chosen institution.